The essence of Australia's Red Centre is revealed on this extraordinary journey into Australia's heartland. Explore the spirit of the Red Centre on this family adventure. Venture into the rugged heart of the West MacDonnell Ranges with your private guide. 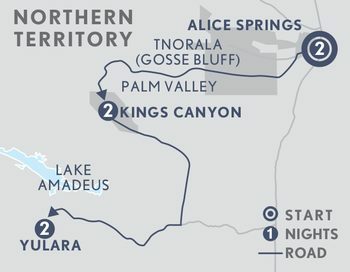 Drive through the Outback from Alice Springs to Kings Canyon. And witness the splendour of Uluru at sunset. Meet your local guide for a tour of “Alice”. Spend time at the School of the Air and the world-first Royal Flying Doctor Service for a fascinating insight into education and health care in the remote Outback. Journey through the dramatic West MacDonnell Ranges to Simpsons Gap and majestic Standley Chasm for a picnic lunch and billy tea. Collect your 4WD Land Cruiser and embark on a self-drive adventure to Kings Canyon via the Mereenie Loop through the spectacular Central Desert landscape. Arrive at Kings Canyon Resort, an oasis in the red desert plain. Choose your own adventure today. Venture into the heart of Watarrka National Park to the majestic Kings Canyon. Opt for the easy 2km Kings Creek Walk or the more challenging 6km Rim Walk. Stroll around 400-year-old cycads to find striped stone domes and the Garden of Eden, a lush green valley that leads to a permanent waterhole. Afterwards, retreat to the resort pool. Drive to Uluru, stopping en route at Curtin Springs, a legendary outback cattle station. Return your vehicle at Ayers Rock town centre before meeting your driver-guide for a private tour of the massive rock domes of Kata Tjuta (“The Olgas”). Explore the ancient rock formations that spread over some 20 kilometres and, this evening, marvel at the epic Field of Lights art installation inspired by wildflowers. Morning at leisure. Perhaps a trip to the Uluru-Kata Tjuta Cultural Centre to discover the lore of the traditional Aboriginal owners, the Anangu people. You may like to uncover the secrets of Uluru with a guided tour around the base, or take yourself on the gentle, fascinating 10km walk around the base of this impressive monolith. This afternoon you set sail on a ship of the desert – a camel. Ride over the dunes at sunset and drink in the ever-changing colours of Uluru and Kata Tjuta as cameleers reveal the fascinating natural history of the area. Day 7: Depart Uluru. Rise early to watch dawn break over Australia’s greatest natural icon, before your private transfer to the airport.